Here at TeeHunter, we like a challenge. We also love Stranger Things. Obviously, we love t-shirts. This is a post where three of our favorite things in the world collide. 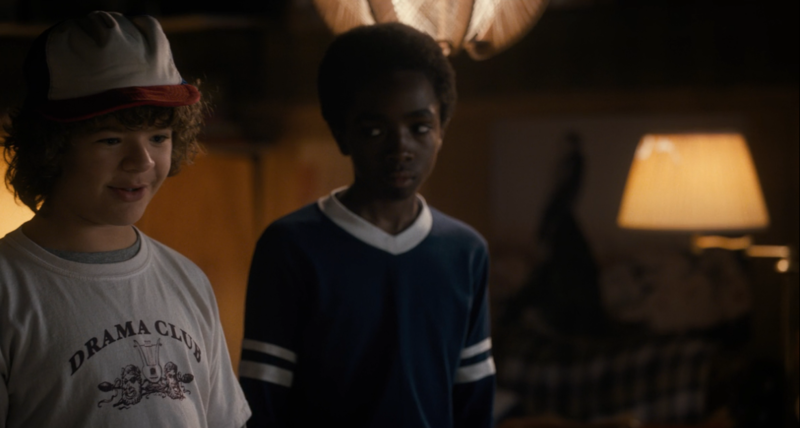 Dustin wears a lot of t-shirts in Stranger Things. Have you ever wondered if those t-shirts are available somewhere? Just in case you’re thinking about putting together your Dustin cosplay early, or you just want to wear a really cool t-shirt, we decided to hunt down as many of them as we can. After all, we’re the Tee Hunters. That’s what we do! 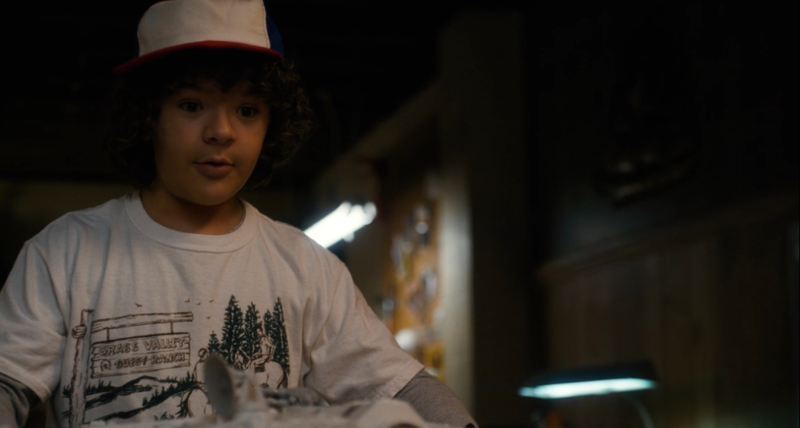 Dustin doesn’t wear a visible t-shirt in some episodes. He really likes his hoodies, and both seasons take place during the Fall months anyway. There’s still a good number of visible t-shirts to be seen, though, and they’re all awesome. T-shirts tell a story, and each t-shirt Dustin wears tells us something about him. This was the first t-shirt we ever saw Dustin in, and it’s arguably one of the coolest of the lot. Episode 1 kicks off with the boys playing a game of Dungeons and Dragons in Mike’s basement. 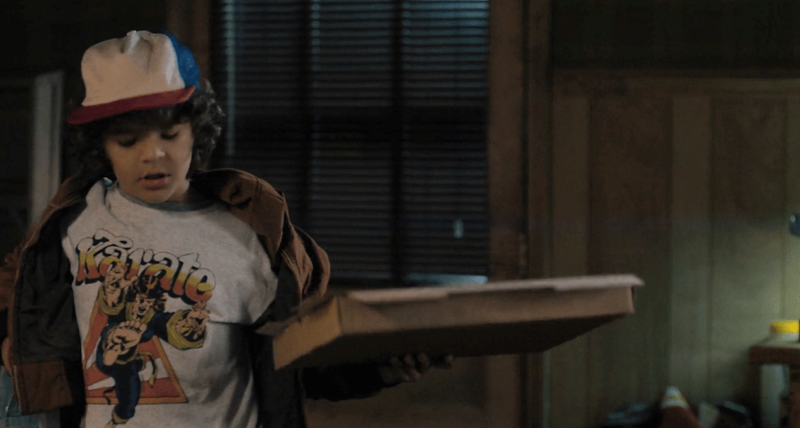 Dustin shows up in this awesome shirt and a box of pizza, and he’s immediately reminiscent of that one kid in middle school we all knew who had all the cool t-shirts from places he’s visited or video games he’s played. This shirt is very 80’s. It’s also vaguely reminiscent of the old Street Fighter games, but it’s also believable that Dustin actually got this while learning Karate himself. Maybe in order to fend of bullies? Either way, from the get-go, we know this kid is awesome. 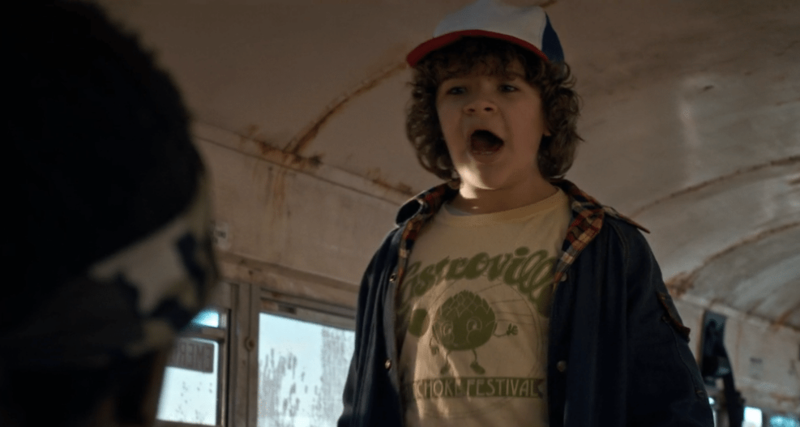 This is one of the more forgettable t-shirts, but I love it because it’s very clearly designed by an overworked school employee, and because it implies that Dustin was not only a D&D nerd, but a drama nerd, too. Dustin’s just too cool for the rest of us, okay? We can’t handle him. Admit it, when you were a kid, you had t-shirts that your parents bought you from cool vacations you took, too. At my house, we were all about Astoria, Oregon. It’s this decently-sized coastal town on the edge of the Pacific Oregon, and we’d always go camping just outside of it and spend a whole day wandering around gift shops. We wore our Astoria t-shirts and sweatshirts with pride, just like Dustin wears this Grass Valley Ranch t-shirt. 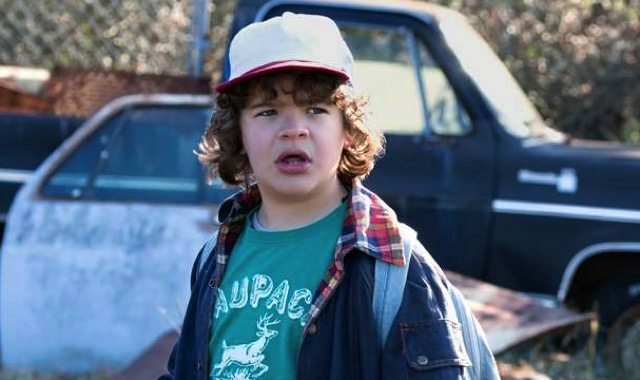 Speaking of t-shirts from locations, Dustin has this cool Waupaca t-shirt that he wears in Episode 5. You know, that episode where the gang is walking around for most of it, grumbling, fighting, and trying to find “The Gate”. Unlike Hawkins, Waupaca is a real town in Wisconsin. There’s not much there, so we doubt Dustin got this while he was on vacation. We do know from conversations with Mike that Dustin wasn’t born in Hawkins. He moved there. Maybe he moved there from Waupaca, and kept a t-shirt as memorabilia? Castroville is a town in Texas that’s famous for its artichokes. The artichoke festival is a real thing. They even name honorary artichoke queens! If you remember Dustin’s mom from Stranger Things 2, this seems like the sort of thing she’d be interested in. I’m sure Dustin has been to his fair share of artichoke festivals. He probably likes them, considering he still wears the t-shirt. Ah, the epitome of nerdy t-shirts: the illustrious periodic table shirt. I knew people who wore this shirt, and yes, they were exactly like Dustin. I was one of those people (only my shirt was purple)! Whether he got this from Hawkins Middle School, or he bought this in a gift shop because “the periodic table is cool!”, either way it’s totally believable. It took me a minute to realize what the text said on Dustin’s t-shirt here, but after that it wasn’t too hard to find. It says, “there’s no place like school”. As far as we know, this isn’t a real sports team, and Pennville isn’t a real place. Even so, it makes for a pretty cool t-shirt. What kind of sports team was this? It might’ve been baseball or soccer. I doubt Dustin is a football person. Ah, the holy grail! 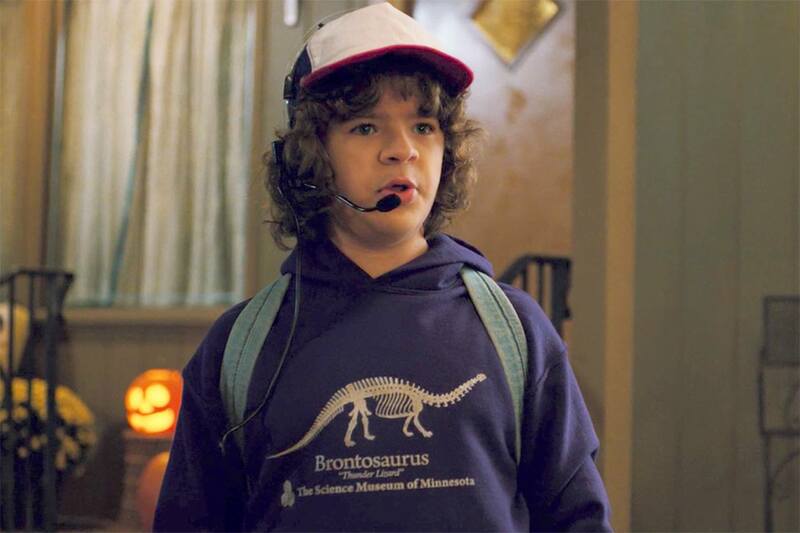 Dustin’s famous Brontosaurus hoodie from Stranger Things 2. The Science Museum of Minnesota was all over that the minute the season was out. Fans actually crashed the Museum’s website in a mad dash to purchase hoodies before they went out of stock! The Science Museum of Minnesota now has a whole hoodie collection dedicated to replicating Dustin’s “thunder lizard” sweatshirt. Head over to their website to purchase one! Love ‘Stranger Things’? 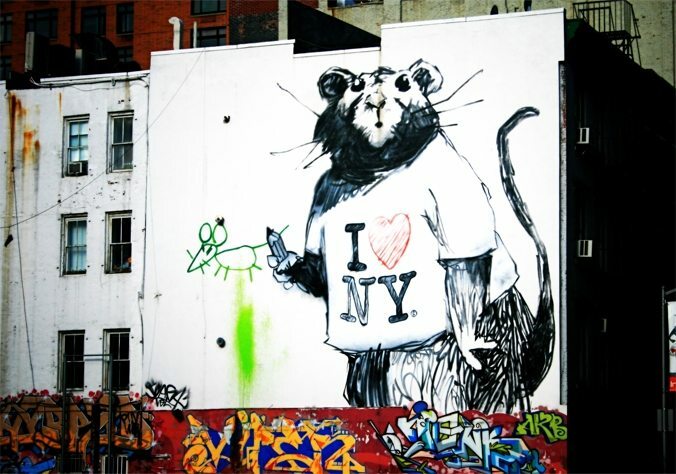 We have a whole collection of t-shirt’s you’re going to like. I beg to differ. Pennville IS a real place! Pennville, Indiana. Look it up, it’s on the map. It’s my hometown. We were the Pennville Bulldogs, not the Pirates.